We at mera blood hold your personal information in the online management system supplied by you when you register as a blood donor. You can easily change, edit and update your personal information. 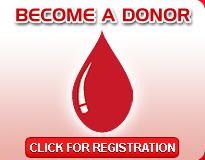 Mera blood is just a medium or platform between blood donors and blood recipients which provide and easy and efficient access to the blood recipients to blood donors. We collect only your contact information, date of birth, your residential address and blood group so that blood seeker can easily contact with you. When you want to remove your account from our data base you just have to mail us and we will do it. We are committed to maintain your privacy, so our websites and our computer systems have security measures in place with the aim of protecting the loss, misuse or alteration of personal information held by us.